The photographic exhibition of the history of Konitsa is located in a restored traditional building of 1869-70, near the stone bridge over the River Aoos. It hosts a photographic exhibition of the history and monuments of Konitsa. Through its’ photographs a long period of human presence in the region is covered, from 15000 BC until the late 19th century AC. The Ethnological Museum of craftsmen of Epirus in Pyrsogianni is located in the municipality of Mastorochoria, Pyrsogianni, in the stone built of old school. The museum is an important contribution to the history of craftsmen of stone in Epirus and hosts over 2500 photos, drawings, stamps, mappings, contracts, tools, services, and rare material, which is related to the secret language of craftsmen called "koudaritika." The material exposed to the museum is a systematic inventory of local architecture, materials and aesthetic currents of the last three centuries in the Balkans. The environmental park-museum of natural history in Bourazani is located over an area of 1200 acres and hosts small populations of several species of wildlife such as deer, fallow deer, wild pigs and goats and is an area for visitors. In its’ places as well, there is a museum of natural history, referred to rare biological resources of the region and the biological cycles of wildlife. Rizario Exhibition Centre of Monodentri is a modern center of gatherings and exhibitions, located in the fully renovated and landscaped mansion of Pantazis and occasionally hosts some very interesting exhibitions. The Folklore and Historical Museum of Elafotopos is located in the building of the former primary school of the village and presents the utilitarian objects of traditional manual occupations in the form of organized workshops, so that the visitor has a full and distinct image of these professions by subject. The folklore museum of Agapios Tolis in the Kipous, includes artifacts from life in Zagori and foreign land, divided into thematic sections. In the museum thousands of objects are kept, among of them are included traditional costumes, jewelry, fine chests, household and brass kitchen utensils, and tools. The botanical museum of Kostas Lazaridis in Koukouli, includes samples of 1300 species of plants of the Vikos Gorge and the region of Zagori, the personal library of Mr. Lazaridis with 4000 volumes, as well as photographs of the activities of the villages of Zagori. The information center for nature and culture of Zagori in Papigo is located in the old elementary school of Mikro Papigo and the purpose of its function is to introduce the visitors to valuable ecological and cultural values of the area. 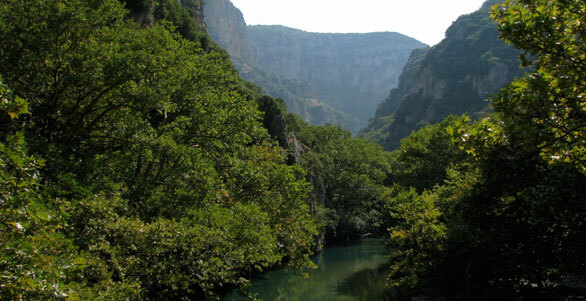 In the center, visitors have the opportunity to be informed about the region, history and culture of Zagori with particular emphasis on Timfi Mountains and National Park of Vikos – Aoos.